Sign up for Broadjam today to follow Crooked River, and be notified when they upload new stuff or update their news! 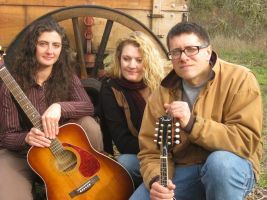 Crooked River is a three piece accoustic band playing original songs that feel like classic country. Their vocal harmonies and song contructions are reminiscent of Sons of the Pioneers, The Carter Family, Marty Robbins, Hank Willams and Buck Owens.